(Central Islip, N.Y., June 27, 2018) – The Atlantic League of Professional Baseball Clubs today announced the coaching staffs for the 2018 Atlantic League All-Star Game, presented by Good Samaritan Hospital Medical Center. The All-Star Game will be held at Bethpage Ballpark, the home of the Long Island Ducks, on Wednesday, July 11th at 6:35 p.m.
Long Island Ducks manager Kevin Baez has been selected as the manager of the Liberty Division squad. This will be the former Major Leaguer’s third time managing at the Atlantic League’s midsummer classic, with his first two coming in 2012 and 2013. 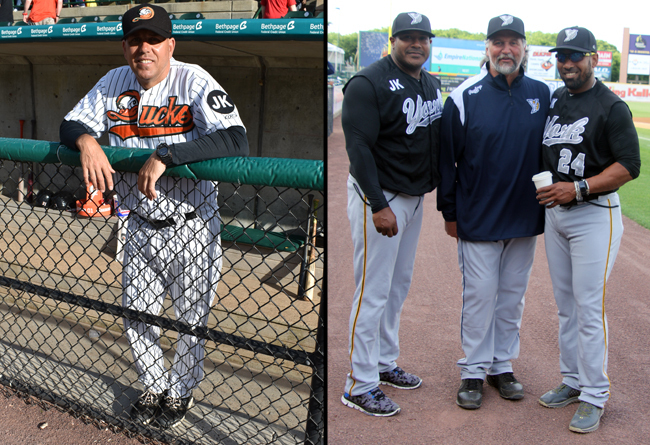 The former infielder is currently in his eighth season managing the Ducks and has led them to six half-season division titles, five Liberty Division championships and two Atlantic League championships. Baez has guided Long Island to consecutive appearances in the League Championship Series over the past two seasons and is the franchise’s all-time winningest manager with over 450 victories. The Brooklyn native earned three consecutive Atlantic League All-Star Game selections while playing for the Ducks from 2002-04 and was named the Most Valuable Player of the 2004 midsummer classic after going 2-for-4 with two RBIs. Baez will be joined on the Liberty Division’s coaching staff by fellow Ducks coaches Lew Ford (hitting coach), John Brownell (pitching coach) and Bud Harrelson (coach). Ducks Head Trainer Dotty Pitchford will serve as the Team Trainer for the Liberty Division. York Revolution manager Mark Mason has been chosen as the manager of the Freedom Division roster. This marks Mason’s first time managing at the Atlantic League All-Star Game, though he served on the Freedom Division’s coaching staff in 2011 and 2012 under then-Revolution manager Andy Etchebarren. He is the winningest manager in Revolution history, entering the season with 351 victories over his first five seasons guiding the club. Mason led the Revolution to the Second Half Freedom Division title in 2017 as well as a 6-1 postseason record en route to winning the franchise’s third Atlantic League championship and first since 2011. The 6-1 run through the playoffs established the best postseason mark in Revolution history. He was named the Atlantic League Manager of the Year in 2014 and has guided York to three postseason appearances as the team’s skipper. Mason will be joined on the Freedom Division’s coaching staff by fellow Revolution coaches Enohel Polanco (hitting/third base coach) and Sandy De Leon (first base coach). Ducks Assistant Trainer Deanna Reynolds will serve as the Team Trainer for the Freedom Division.